Product categories of Mobile Jaw Crusher, we are specialized manufacturers from China, Mobile Jaw Crusher, Mobile Crusher Machine suppliers/factory, wholesale high-quality products of Mobile Rock Crusher Machine R & D and manufacturing, we have the perfect after-sales service and technical support. Look forward to your cooperation! The Mobile Jaw Crusher was designed by ourselves, utilizing the very latest European technology, including finite element techniques to minimize stress levels within the frame itself. Jaw Crusher Mobile Crushing Plant is a kind of new rock broken equipment, mainly used in metallurgy, chemical industry, building materials, water and electricity engineering, to process material often needed to move, especially for liquidity stone processing used in the highway, railway, water and electricity engineering. Mobile Jaw Crusher Plant greatly expands the crushing operation concept fields. Its design purpose is standing in customer's position, to eliminate broken processing barriers given to customers by the broken site, environment as your primary settle solution, and to provide efficient, low cost of the project operation hardware facilities. 4. Strong adaptability and flexible configuration. 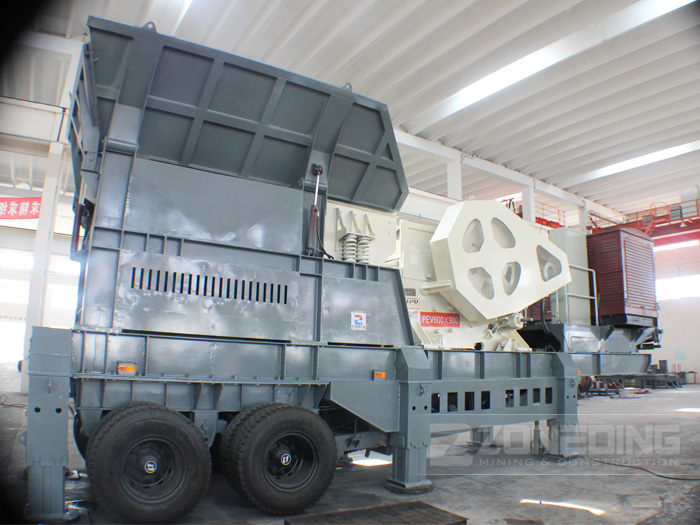 Jaw crusher mobile crushing plant, in view of crushing, screening system, can be independently operate in single unit, can also flexibly composite system configuration unit to joint work. Discharge hopper side out for screening materials transportation mode provides a variety of configuration flexibility, the integration of the diesel generator unit configuration in addition to giving the unit power supply, can also pointed to the process system configuration unit for the joint power supply.